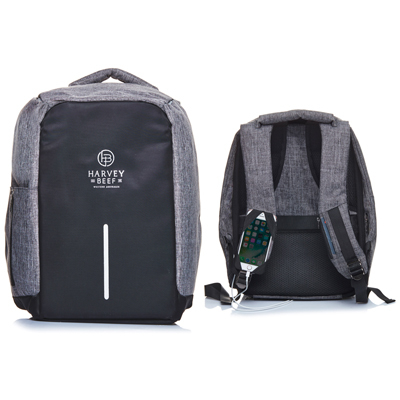 This Anti-theft backpack is perfect for students and day to day business commuters. The bag is made of a durable polyester material with a heat and water-resistant panel on the front with reflective safety stripe. Additional reflective material is sewn into the top corners helping to provide visibility of the backpack in low light. Additional features outside the backpack include: an expandable zippered pocket perfect for holding a variety of different drink bottles, padded carry handle, breathable padded mesh backing, back luggage strap, hidden zippered side pocket, a bottom zippered pocket that includes a rain guard that can be quickly expanded over the entire backpack, and a USB outlet that connects internally allowing you to connect a power bank to your devices on the go. There are additional features on the straps of the bags as well which include: convenient elastic straps to secure a smart phone or other device, a zippered pocket and a separate card slot perfect for public transport cards. Main compartment zips discreetly from back and zippers are hidden under a fold to help prevent theft. The inside of the commuter backpack has two padded pockets for storing a laptop and tablet that secures with an elastic strap. There are three additional padded open pockets for securing devices or accessories and an internal zippered pocket for storing special items. Each bag includes a hang tag outlining the features listed.